Cucumber salads are perfect for cooling off on hot summer days, or simply adding a bit of crispy crunchy delight to heavier meals. The salad below all heavily feature cucumber, so they have plenty of cooling power. In general, I prefer to remove the seeds from cucumbers, even when tossing them in salads. The easiest way to do that is to cut the cucumber in half lengthwise (peel it first if you want to peel it), then use a small spoon to scrape and scoop out the seeds in the center. It's an extra step, but it will keep your salads from getting watery or tinged with the slight bitterness those seeds tend to bring to the party. 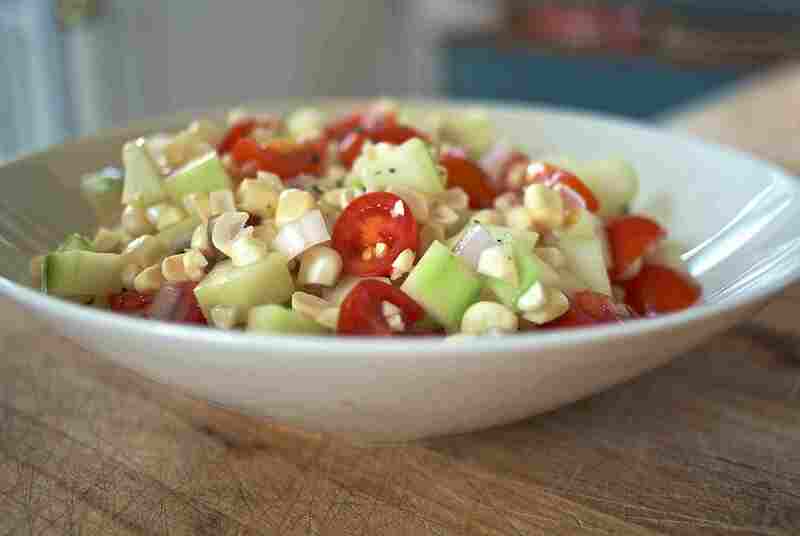 Diced cucumber and tomato are tossed with fresh corn kernels in a confetti-like mixture of color and texture. This corn cucumber tomato salad is particular delicious alongside grilled main dishes and can even be used almost like a relish. Shredded cucumber is dressed with garlicky yogurt in this simple, refreshing, cooling, salad, also known as tzatziki. It is great served alongside grilled meats or as part of a salad plate. This recipe calls for garden or English cucumber, but really any type of cucumber works great - you will just need to adjust the amount or number of cucumbers used. Fattoush salad is a great mix of fresh lettuce, crisp cucumber, sweet tomato, a bright dressing, and pieces of crisp pita bread. Add feta cheese, olives, pepperoncini, and other flavorful items at will. Easy, light, yet filling - it's a great addition to grilled dinners or as a light dinner all on its own. This tossed salad features cucumbers, carrots, mint, dill, and parsley. It's a fresh, refreshing, and easy addition to simple meals. The cucumber brings a softer crunch that's lovely next to the solid nature of the carrots, while all the herbs bring everything together flavor-wise. Radishes and cucumbers bring plenty of refreshing crunch and mint add a great hit of flavor to this easy summer salad. Use your favorite creamy dressing (we like buttermilk dill dressing or yogurt garlic dressing on this salad). This simple mix of wheat bulgur, chopped tomatoes, diced cucumber, and plenty of minced parsley all tossed with a dressing laden with lemon and a touch of garlic works on its own or as part of a salad selection. Perfectly lovely on a plate with grilled meats. The proportions are endlessly flexible, too, so it's easy to customize from this recipe to make your perfect tabouli salad.